Greetings everyone! I’m posting this on Sunday, July 23, 2017. 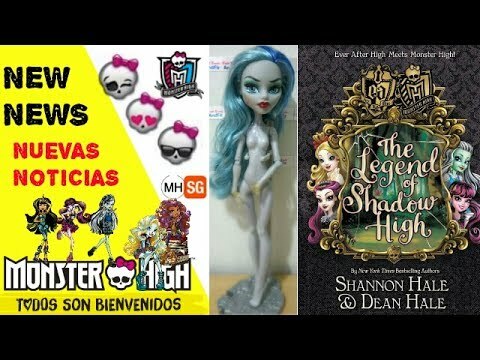 This is the last day for the 2017 San Diego Comic Con and the most disappointing Comic Con for Monster High or Ever After High Collectors. I was a little excited about this doll because (a) articulation and (b) cute! but then I started looking more closely. THIS is the first reveal? She has “molded” tights, or at least painted on tights, no paint on her accessories. She’s just not the same quality I expected to see. I mean, go look at the reveals from 2014 or 2015 . Also, where did I go in 2016? Hmp? Anyways. It just isn’t what I had gotten used to. What do you think? Clawdeen in this line? Or just a test? Who do you want to see ballet-ed up? I will admit, I am NOT a minis fan. I don’t like blind bags in general and these are just kinda small for my tastes. I’m not the biggest fan of the pets, because some of them just get a little too much exposure (I have like 5 Neptuna figures….) Some people were super excited for this, though, some I’m not trying to rain on your parade. Ugh. So I’m a super articulation snob when it comes to MH. That is one of the main things I loved about this line when I started collecting. I can’t explain it. I’m not that picky with my Barbie dolls, but MH is supposed to be that super fun line where they can be freaky fab. This isn’t that. I want to like that little sister. I mean, the fact that her eyes are a reverse of Frankie’s is cool, if not kinda creepy. I want to like little Alivia. (Should we pronounce that like Olivia? or ALIVE-ia?) She’s cute, but like all of the younger siblings, she’s not more than that. I love the Frankenstein-posed-arms, though. Maybe I’ll get her just to see? I found the other individually packaged little sisters at my Wal-Mart recently, and although I walked around with the sea-sister, I didn’t end up buying her. Lastly, we come to today. Sunday’s reveals are either super awesome or a super let-down. Maybe because they were all not exciting to me, this wasn’t super awesome. The text on the shadow yesterday on Instagram said “We’ve heard your screams mansters & ghouls! So, get ready to howl over tomorrow’s freaky-fierce final reveal!” Really? You heard us? I don’t think so! Okay, don’t get me wrong, I know there are a lot of Howleen fans out there, so that is probably what they were referring to. But I promise no one was screaming for more non-articulated dolls! I promise I get it; adult collectors make up such a small part of the market. In my small town there are 3 other adults ( that I KNOW of) that collect. There are MANY more kiddos. I get it, I promise I do. But don’t those kids like the articulated dolls? I know that those cheaper dolls have their place. I actually really love the Emoji-style dolls that should be around $5. I hate being in the toy aisle and hearing a kid say they don’t have enough money in their tiny little coin purse for a doll. But we should still be getting SOME high quality fully articulated dolls, shouldn’t we?! There wasn’t a single doll revealed in this SDCC weekend that matches the quality we fell in love with from MH. Not a single one. We have no news of a movie release? No news of other lines? I just can’t get over this huge feeling of disappointment. I’m not trying to be a Debby-Downer. I mean, there is a Ghoulia doll coming out of all of this. Well, maybe I’ll get one. Mattel’s new website ate my order. PayPal still has my money on hold, but Mattel has NO record of an order placed and an email to their Customer Service has so far been unanswered. What about you? Were you excited for any of the reveals? Convince me of your love. I need some MH love right about now. Well, to be frank, I think it’s long past time people accept that MH is now skewed younger. I even rewrote a bit of Let It Go yesterday as a joke and made the lyrics aimed at MH fans who can’t. Certain lines are going to be aimed at younger kids. And I mean MUCH younger, to the point where the removable body parts become a hindrance. The family line is one of these. And because they’re skewing younger, that means some of the reveals will be for the young fans. Blind box toys are also crazy popular right now and I think the mini pets are so adorable. I hope they do Shiver. So I don’t think they missed a mark there at all. I do think it seems they’re focusing a bit much on the unarticulated dolls right now, but it’s because the family line is one of the two focus lines. And I do wish they’d give us more reboot dolls along the quality level of the newer signature ones. I’m likely never going to see my signature Sylvi, but I won’t stop hoping. However, if you take a look at the Garden Ghouls, you’ll see a line not only on par with the pre-reboot dolls, but actually much better designed than several of the same price range dolls we got over the years. Dance Class. Any of the swim lines. Creepateria. That mess they did with the Fusion skinny box line. Hell, I think they’re even better than Coffin Bean and Coffin Bean had some great designs. The outfit quality, wing quality and makeup design are excellent. Hair quality will be a nitpick for those that are hair type purists and the joints aren’t perfect, but at least the overly beloved articulation is there and the design is definitely there. So it’s not like these lines don’t exist. There are just less because there’s much less MH right now. EAH seems dead. MH is a new animal now. If people can’t handle it, it’s time to enjoy what little you still like, maybe buy some older dolls you missed, and find something else to be the new thing. It’s really not worth the negative fuss I’ve seen lately. Sometimes it’s just time to move on. Mattel should just kill MH and that’s it, instead of continue milking what barely even left. My biggest disappointment from this SDCC and Mattel in general is the cancellation of She-Ra action doll which I look forward to. Ihoped they at least make Catra (which is ine of my favorites) and SDCC exclusive or something. On the bright side, Mattel is now making a new action doll (more like fashion doll-single joints) and action figure of WWE for girls. They have the new Wonder Women body with wrist swivel which is great. I highly doubt there many women or even little girls who are WWE fans, but this line looks pretty neat and good substitute for dying MH and EAh, plus they do’nt have gaint heads. 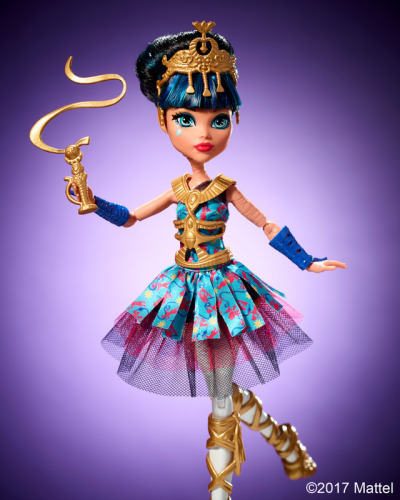 I work with a girl scout troop (elementary and junior high age ranges), and a bunch of the girls were complaining about the newer dolls, and specifically articulation. They thought the ones with more articulation were more fun to play with and pose. One younger girl mentioned that she hated trying to get the sleeves over the hands now, whereas before she could just pop them off. As an adult that has enjoyed customizing them, I’m really disappointed in the lack of articulation now. I wasn’t a seller so much, but I made customs as gifts for friends and family. I liked supporting Mattel ( I purposefully looked for ones with bad paint jobs so I wouldn’t take the nice ones from kids), but now I’m finding myself buying the Chinese replicas so I can get the articulation. That right there is a very sad feeling. 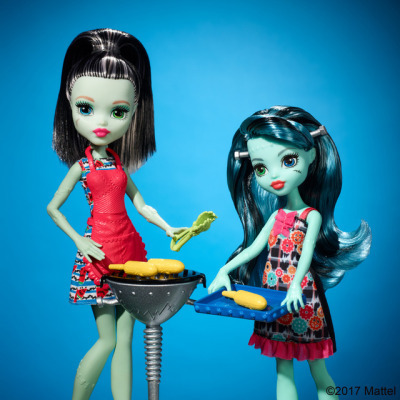 I would have loved for my classic Frankie to have a little sister… but she’s not getting one if they don’t make a higher quality doll. This may sound weird, but… thank goodness you’re not the only one with a pending PayPal charge that shouldn’t be there! I tried ordering three times – twice with PayPal, once by entering my Visa into the site – and both times with PayPal the website said it was rejected. And the successful order, from the confirmation on the site to my bank account to the order slip in the box when I got it, says it’s direct to my Visa. Yet the charge remains, though it’s still “pending”. I emailed their customer service twice and also got no response, so I’m glad it’s not just me. I have to assume they’re just never going to collect on that PayPal charge, and it’ll eventually disappear on its own, because otherwise won’t they be at the center of a mass robbery…? 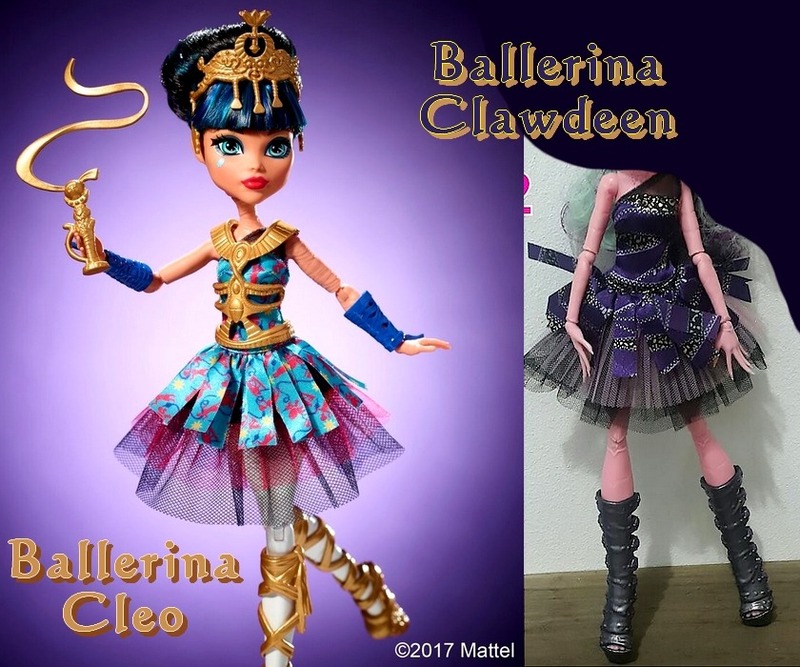 As for the reveals… honestly, I think Cleo and Ghoulia were my last MH purchase that was full price and not in need of modification (Party Hair Draculaura was thirteen bucks and went on a new body! lol). I’ve got my first Licca coming in the mail, I pick up accessories and shoes from eBay now and then, I’m getting Bratz dolls from Tuesday Morning to give their clothes to the Gwen Stefani doll from KKH… I’m definitely still buying lots of dolls and doll-related things, they’re just not MH. For me MH has lost the attention to detail that made it special. I still enjoy the ones I have, but I don’t see myself adding many (if any) more to my collection, and the reveals just cement that feeling.